The LABIDURIDAE family of earwigs consists of relatively primitive species that are predominantly a red-brown colour and range from 10 to 45 millimetres in length. Members of this family are found all over Australia. Labidura truncata is by far the commonest species, particularly in sandy habitats. It is approximately 35 millimetres long and dull brown with straw coloured markings. The male have long slender pincers with a distinctive tooth near the middle of the inner edge. The name 'earwig' come from a European myth that these insects had a habit of crawling into human ears. However the name most likely comes from the term 'ear-wing', referring to the shape of the hind wing. Earwigs mate end to end, often grasping each other's pincers, Female earwigs are able to store sperm for several months before fertilisation. A female will lay hers eggs in a burrow she has excavated or in natural crevices in the soil, where she will stand guard protectively until the young hatch. The female guards the eggs from predators and constantly turns and cleans them, preventing fungus diseases. Upon hatching the young earwigs resemble small adults and remain under the protection of their mother for a short period of time. They must then disperse to new areas or risk being eaten by her. Most species of earwigs are omnivorous and eat a wide variety of plant and animal material. Many species live primarily on a diet of plant matter, both living and decaying. They also consume dead insects and other organisms, while some species prey on live insects. The cerci are often used to hold food and carry prey after it has been killed. Labidura truncata is a large native earwig that prefers to feed on soft-bodied caterpillars both larger and smaller than themselves. It grabs a caterpillars with its pincers and holds it there while feeding. L.truncata may also feed on other insects, including other earwigs if it is hungry enough. 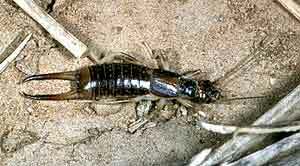 Earwigs are commonly found in dark, sheltered environments and are common under rocks, logs and the bark of trees. They are common over most of Australia and many species frequent suburban backyards and homes. Earwigs are nocturnal and may often be attracted to lights at night.